FordPass is helping to make your journey easier! It’s an app that gives you new ways to park and connect with your vehicle. With FordPass on your mobile device, you can do things like search for a parking spot, see if your car needs gas, and even find a dealer to keep it running smoothly. With a SYNC Connect-equipped 2017 F-150, Escape or Fusion, you can also unlock and start your vehicle with just a tap. Plus, have your vehicle ready to go when you are by scheduling it to start automatically. Roadside assistance is accessible for help towing, jumping-starting, changing a flat tire, fuel delivery and much more! The FordPass app is also your key to our friendly and knowledgeable team of FordPass experts. FordGuides are always happy to help you with any FordPass needs or questions that you may have. Today drivers are expecting more from their cars and Ford is proud to offer technology to keep you connected even while you are on the road. Ford’s SYNC technology is available on a range of new Ford vehicles. Be sure to check out the technology when you come to test drive an Escape, F-150, Fusion, Super Duty or any other Ford vehicle! 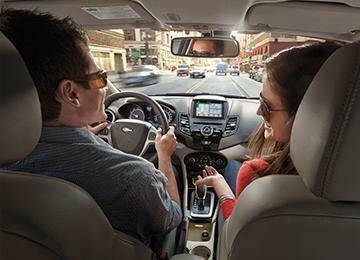 Ford’s SYNC technology allows you to use voice activated controls to make a call, listen to music and much more! You can choose from SYNC with MyFord, SYNC with MyFord Touch or SYNC 3. All of the SYNC technologies allow you to use simple voice commands to do a number of tasks. They allow you to keep your hands on the wheel and eyes on the road. With new SYNC 3 technology, you’ll get an interface that is more responsive and innovative. SYNC 3 can bring the power of Apple CarPlay to your Ford vehicle. You can use Siri to interact with your iPhone. Make calls, return missed calls, listen to voicemails, as well as send, read and reply to test messages. You can even access your songs and playlist. SYNC 3 can also bring the power of Android Auto to your Ford vehicle. You can talk to Google to interact with your smartphone while keeping your eyes on the road and hands on the wheel. Make calls, return missed calls, and listen to voicemails as well as send, read and reply to text messages. You can also access your favourite music through your apps, get voice-guided navigation, live traffic information and estimated travel time. 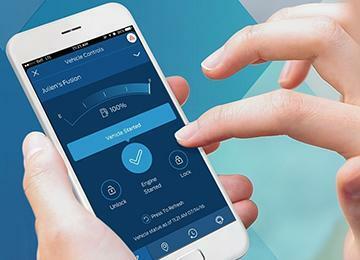 With a SYNC Connect-equipped vehicle, you can use the FordPass app to track your vehicle’s location and remotely access vehicle features such as start, lock and unlock and vehicle status including fuel level and approximate odometer reading. You can also schedule specific times to remotely start your vehicle so it’s ready to hit the road as soon as you are. SYNC 3 also allows you to use your voice to set your favourite temperature or access the colour touch screen to adjust the temperature controls. Your SYNC 3 equipped vehicle will also stay current with automatic updates anytime a Wi-Fi connection is available.